As human costs rise and competition with other emerging economies intensifies, Chinese manufacturers turn to technology to increase productivity. China, once known as the "workshop of the world", has become the largest buyer of industrial robots in the world. In 2013, China purchased 1/5 of the world's robots, surpassing Japan for the first time. According to the latest data from the international robotics Federation (IFR), China purchased 36560 industrial robots last year, an increase of 60% over the same period last year. Japan bought 26015 robots last year, the United States ranked third, bought 23679 robots. From 2008 to 2013, China's robot purchases increased by an average of 36% annually. The potential growth of the Chinese robot market is more objective: in 2012, there were 23 robots in every 10000 people in manufacturing factories in China, which was far below the 396 in South Korea. Judging from the amount of input, China is far less developed than the developed countries. 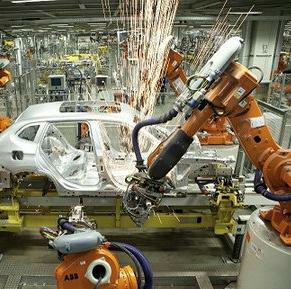 In 2012, more than 310 thousand industrial robots were put into use in the world. The number of robots used in the United States was 168 thousand in the year, and only 96 thousand in China. "China has the fastest growing robot market in the world," said Per Vegard Nerseth, director of ABB robotics. In the next few years, the Chinese market will be significantly larger than second and third of the robot market. " China's growth in demand for robots is mainly driven by large multinational manufacturers, especially automobile manufacturing. According to Solidiance, a management consultancy, China has the world's largest auto industry, which accounts for 60% of the country's robotics demand. According to the financial times, the global robotic company, such as Swiss ABB, Japanese Fanuc and German Kuka, have put a lot of resources into the Chinese market to catch up with China's rapid automation trend. In 2011, Foxconn, the apple OEM, announced that it would take more than three years to build a "million robot army" to replace the repetitive manual operation of workers. Dieter, head of Solidiance Asia Pacific, said Japan is still the dominant player in global robot manufacturing, and six Japanese companies have sold about half of China's robots. By contrast, China's four largest robot manufacturers share only 5% of the market share.